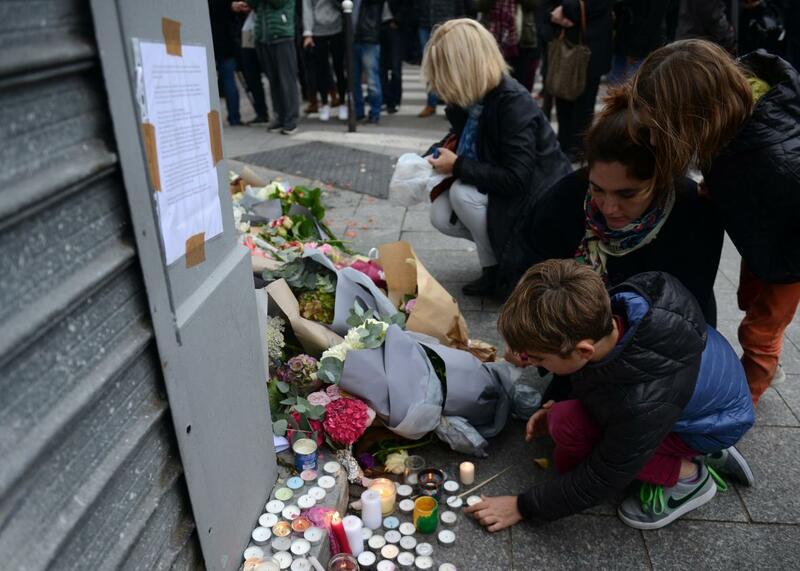 Children light candles outside Le Petit Cambodge restaurant on Nov. 14, 2015, in Paris. Traumatic world events are difficult to contextualize for children this young. It’s not on the same scale as an event that touches them personally, but it makes no impact on any larger scale (say, a pet dying or a parent or sibling being injured). Their knowledge and lasting impact depends entirely on their parents, who are their emotional models. This is not just understanding mentally what occurred, but understanding how to process things emotionally and literally understanding how to act, both privately and in public. Two things happened in my family in this age range: Chile had a major earthquake (my entire family lives in the prime damage zone—the capital city area—including my mother). I was dealing with figuring out how everyone was doing with limited connectivity and dealing with consulates. Also, the Ariel Castro horror was discovered, which while not a traumatic world event per se, certainly was a horrific national news event for a while. I handled the former much better than the latter. The point is that as much as we’d love to be able to deal with and process emotions on our own time frame, when you have young children who are just learning about the world, the stability or fragility of their physical and emotional environment, and the limits or freedom of their exploration, you can’t afford this indulgence in an unmodified fashion. It will affect your child. Feel and process, of course, but be mindful of how personally your child is taking everything. Between 4 and 8, they are starting to move from a very ego-centric mind frame to a more empathetic mind frame. The older they are, the better they can understand that your unhappy feelings are NOT caused by them. (As they assume all happy feelings are caused by them.) It’s an important distinction. When they’re younger, despite what you say, they will have some belief that your unhappy feelings involve their action or inaction, simply because it is nearly impossible for them to imagine some mindset that does not involve them as the primary protagonist. This is a really packed concept, but hopefully clear enough in short form here. In this older phase, however, they begin understanding the larger world and its impact on them and other people. If they hear of something occurring in the world, they do not necessarily assume that they are the cause (but they may not have any interest, either). However, they still take their parents as the key emotional and psychological response models. Express your emotions and discuss the events that are occurring in broad terms. However, try to refrain from detailed descriptions, as these tend to work their ways into vivid dreams and nightmares, which lead to latching onto these in fear. (“I’m so worried about those hostages in Paris. I hope they’re OK.” versus “I can’t believe how many of those people were blown up! Turn on the news—check out those bodies! They shot dozens of people—it’s incredible. Is it the start of a war with ISIS?”) While you may think kids are inured to images of violence and gore, they’re really not, especially at this age. We had this one when the girls were taken from the school in Nigeria (and then essentially forgotten). We followed that daily, and our daughter had just started school, not understanding why the girls were out of school and why their parents weren’t putting them back in to play. We had to explain cultural differences, the luck of our own parents’ immigration to the U.S., the value of girls in different societies, and our own unwavering high value of her. She had a lot of very interesting questions. I’ve never been so grateful to be in a country that forces all children to go to school in my life. The big fear for them at this age is: “Why are Mommy and Daddy afraid or upset? Will this happen to me? Did this happen to people I know? Has this maybe not happened yet, but will happen?” (You’d be amazed: Kids have great imaginations, and they can involve time travel.) They could be forced to make some awful choice—hard choices are actually an issue at this age, as they are learning about consequences and working through sequential actions. The learning process for making choices and decisions continues through the early 20s and causes considerable stress until—and even after—then. The best way to handle it is to explain briefly and factually what is going on. I don’t believe in hiding information from children if at all possible. Make the discussion understandable at their age level, and don’t indulge in undue description or ornate adjectives. Just a description and that you are upset and/or angry (or whatever) because this happened. Then ask if they have questions. Don’t laugh at any of them or dismiss them, no matter how ridiculous or obscure they may seem. These are genuine questions and fears, and they represent a brave offering from your child. If you want your child to remain curious and maintain open communication with you as a teenager and adult, do not discourage or judge any form of communication. Give all forms the respect they deserve. Then remind them that they are welcome to ask you more questions whenever they want about this or any other issue. And end with a giant hug and a kiss. Note: This works as a great ending to pretty much everything—questions, hair-brushing, dressing, coming home from school, reading, homework, going to the bathroom, etc. Try it. It’s like the perfect lipstick—it goes with everything. Children: What are the scariest scenes in children’s movies? Current events: Why can’t we just declare war on ISIS and utterly destroy them?